A court is turning away cases because protected trees are preventing construction of a new custody suite. 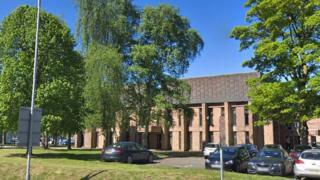 Wrexham magistrates had been using cells at the nearby police station until it closed in January. Since then, all custodial cases have been dealt with ten miles away in Mold. Wrexham MP Ian Lucas said this was causing a great deal of inconvenience to all involved, but council officers claim the trees' value was "priceless" and should be preserved. A tree preservation order was imposed on 14 of the 22 council-owned trees at the site in Bodhyfryd in 2017. But developers working for court authorities want to remove three of the protected trees - including a mature horse chestnut - to make way for a new custody suite to hold defendants. Mr Lucas said the hold-up was causing a great deal of inconvenience to witnesses, victims of crime and solicitors, as well as defendants, whose cases were having to be heard elsewhere. He said he had warned about the implications when plans to relocate the police station - being built in Wrexham library's former gallery - were announced in 2015. "I am hugely disappointed by the time it is taking to sort this out," he told the Local Democracy Reporting Service. "The court is an important civic and commercial facility in the town. We do not want to lose it." However, Wrexham council's head of environment and planning Lawrence Isted urged councillors to keep the trees protected. "The prominence and visibility of the trees provides a 'sense of place' and identity to Wrexham town centre," he said. Mr Isted added that the trees were reaching an age to provide "the maximum environmental and ecological returns to the community; benefits and services which may be considered priceless in terms of climate mitigation alone". Wrexham's planning committee will consider the matter next Monday.